NEW EDITION that adds the missing fifth vocal part! 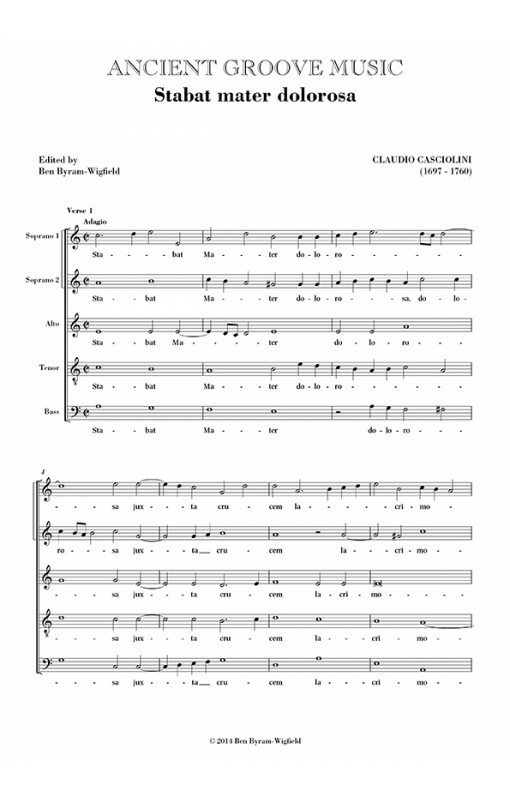 This hitherto rare work by Claudio Casciolini follows the traditional Roman falsobordone practice of two different musical forms alternating between plainsong verses, before a unique final verse. It has been previously published in two 19th-century editions as a four-part work. However, the surviving manuscript source, dated 1751, contains a fifth part (Soprano 1) in the music for the first and last verses. A manuscript copy made by Pietro Alfieri in 1825 seems to have ignored or accidentally forgotten the top Soprano part — possibly an oversight in transcribing from part books? — and this may have been the source for the published versions. The music of the published editions is all but identical to the original, but when the missing part is restored, the harmonic language of the work is clearly completed: this is certainly no ‘descant’ added subsequently to a simpler original. The original manuscript contains only one example of each musical form: the first verse is set as an SSATB Adagio in 4/2; the next musical form is an SATB Andante in triple-time, set to the words of verse 6 of the hymn (Quis non posset). However, this would normally be a plainsong verse in a typical falsobordone. 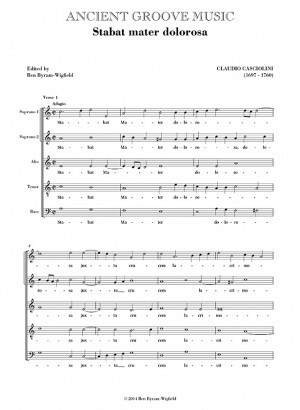 A third music form is supplied for verse 15 (Virgo virginum): an SATB Adagio; and the work concludes with an SSATB final verse that changes meter (Quando corpus). This edition can be heard on the CD 'Spirit, Strength & Sorrow: Settings of Stabat Mater' by The Sixteen.